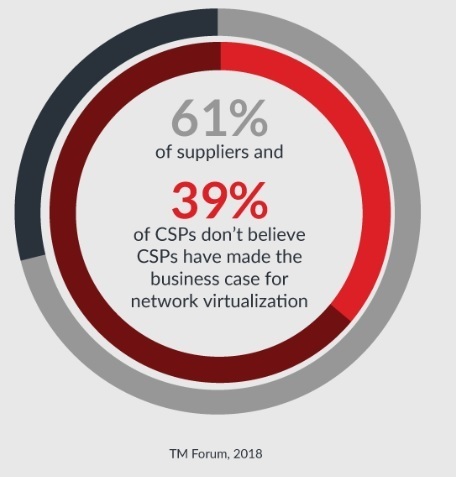 Communications Service Providers (CSPs) are still contending with how to convince customers of the business value of network functions virtualization (NFV) and also struggling with digital transformation (CX), according to a TM Forum industry survey of 160 people from 66 CSPs. Approximately one third of CSPs surveyed said they are deploying NFV in the packet core and 36% reported NFV deployment at the mobile edge or as virtual CPE. The number of survey respondents admitting to having no timetable for virtualization also fell from 30% a year ago to 23% this year. The TM Forum CSP survey, conducted this past summer, was dominated by non-North American operators, with 34% based in Asia Pacific, 24% in Europe and only 3% in North America. 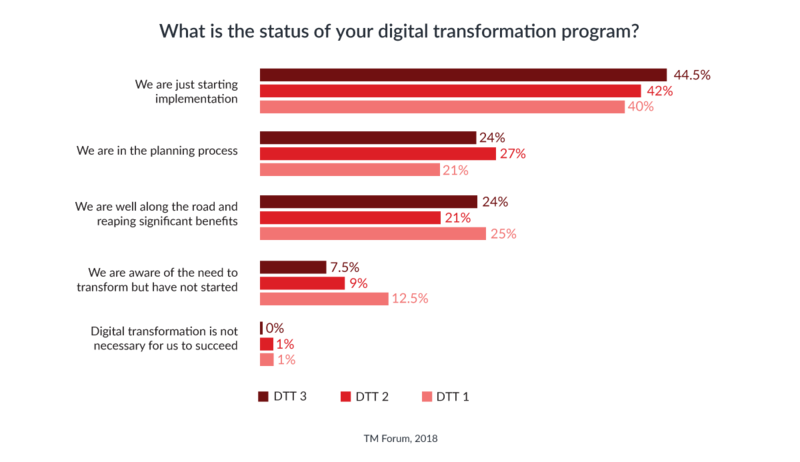 Most CSP respondents are also struggling with network transformation, even though many (44%) think it’s essential to their overall digital transformation process. They are also struggling to adopt new ways of working within their network operations, with 67% admitting they have not introduced DevOps, considered important to become more agile and less siloed, in network teams at all. Speaking during a Telecom TV panel at 5G World, Franz Seiser, VP of Core Network & Services, Deutsche Telekom, explained that NFV is, indeed, a key building block for 5G, but it will take time to implement. “We are not where we’d like to be as an industry [with NFV deployment],” Seiser said, adding that it’s less a technology issue than one of transformation. “We have a big job still head of us in progressing and transforming the way we work.” He noted, however, that there is time to catch up because the first 5G standards are for new radio access only and do not include the network core although the development of these is well underway. Tier 1 CSPs including AT&T, China Mobile, Deutsche Telekom, Orange, Telefónica, Telstra, Verizon and Vodafone have announced publicly that they are embracing NFV and SDN, and our latest DTT survey shows that the pace of network transformation is picking up among these and other telcos. Nearly a third of CSP respondents said they are deploying NFV in the core, up from just 22% six months ago. In addition, fewer respondents said they have no timetable for virtualization, and among respondents whose companies are not yet deploying NFV, one in five said they will start deploying VNFs within the next year. Tier 1 CSPs including AT&T, China Mobile, Deutsche Telekom, Orange, Telefónica, Telstra, Verizon and Vodafone have announced publicly that they are embracing NFV and SDN, and our latest DTT survey shows that the pace of network transformation is picking up among these and other telcos. Nearly a third of CSP respondents said they are deploying NFV in the core, up from just 22% six months ago (see graphic below). In addition, fewer respondents said they have no timetable for virtualization, and among respondents whose companies are not yet deploying NFV, one in five said they will start deploying VNFs within the next year. Not all CSPs are taking the same approach to network virtualization. Some are focusing on virtualizing specific applications, without undertaking wider transformation programs. Others are taking an approach that focuses more on improving customer centricity, particularly for enterprise customers, while many see network transformation as part of a bigger digital or business transformation. TM Forum research shows that 44% of CSP respondents view network transformation as part of overall digital transformation. One of the problems, says TM Forum Chief Analyst Mark Newman, is that CEOs don’t have the confidence in their IT staff to lead a digital transformation effort. Legacy OSS/BSS systems remain the biggest challenge to network transformation, according to 60% of respondents, while 56% ranked security vulnerabilities as a major issue and 52% were concerned with how long it’s taking standards to mature. This entry was posted in NFV status and tagged devOpps, NFV. Bookmark the permalink. Network Functions Virtualization (NFV) enables telecommunications networks to be implemented in software running on high volume industry standard servers as outlined by network operators in a seminal white paper published in 2012. NFV standards have been under development in the ETSI NFV Industry Specification Group since the early part of 2013. The ETSI NFV work provides the foundation for NFV and is being referenced by standards organizations globally, and new open source software communities have sprung up to accelerate NFV implementation. I’ve written about industry progress on NFV in previous blogs but we still have some way to go before NFV is commonplace in telecommunications networks. The key pieces of NFV, notably Virtual Network Functions (VNFs) run on industry standard compute platforms – basically datacenters; and must be dynamically configured and connected at scale to deliver tangible value; automation is absolutely vital for success. Cloud players such as Amazon and Facebook have mastered automation within the confines of their proprietary datacenters, and as a result their operations require orders of magnitude fewer people. New products and services appear at the speed of code, and customer self-service is taken for granted. Concepts that exploit automation such as Machine Learning are being applied which is supercharging the ability of cloud operators to optimize their systems and create cool new stuff. We in the telecoms industry need to also become masters of automation or we will be left behind in the inexorable march to a software defined future. Unfortunately, the industry hasn’t made much headway on the key pre-requisite: automation of the Operations environment. Collaboration to address this essential capability is vitally important for the industry to remain competitive and deliver what our customers need in the future. We have a number of activities around NFV and SDN that we are executing on behalf of MSOs. For example, CableLabs is progressing an intensive study of virtualized provisioning of the cable access network to enable programmability, our NFV/SDN reference platform is based on OPNFV and we are looking ahead to support 5G using an end-to-end virtualized architecture that includes low latency edge compute nodes located at the cable head-end. In addition, we are seeking to accelerate NFV/SDN interoperability through our subsidiary Kyrio which has built an interop lab where vendors can work together with operators to validate interoperability for their SDN and NFV solutions. The NFV journey is only just beginning and 5G will be the first new wave of technology to be designed from the ground up using NFV and SDN technologies. The cable industry, with our low latency access network, is in a leadership position to advance these technologies for the benefit of MSOs and their customers globally. While the need for network automation is becoming a key part of the overall digital transformation agenda, the reality is that the success rate behind previous attempts to drive network automation (a.k.a NFV) is only at about 30%, where the statistics show that 70% of transformation projects fail! Turning to digital transformation, the study shows that the economic impact of the digital ecosystem is greater than that resulting from fixed broadband and similar to that produced by mobile broadband penetration. The study also finds that effective policy and regulatory frameworks can drive growth in the digital ecosystem. The push to more distributed architectures will also drive cable operators toward virtualization, but MSOs are still searching for critical business drivers that will justify major investments into NFV. “You need a business driver,” Don Clarke, principal architect of network technologies at CableLabs , agreed, noting that no service provider is going to switch out technologies just because it’s new and shiny. Though network virtualization trials are firmly underway, overall movement in this area among cable operator is moving slower anticipated as some are either waiting for the right solution or the right opportunity before jumping ahead,” Oren Marmur, VP and head of NFV at Amdocs Ltd.